There is no end in site to the lies, distortions, deceptions, and false and misleading disclosures by Overstock.com's (NASDAQ: OSTK) management team, and in particular, its CEO Patrick Byrne. Demonstrating the level of desperation in Salt Lake City, the Overstock black ops team was set into high gear by mid-January. Early last week, the company's resident cyber stalker, Judd Bagley, attempted to smear me, in an effort to distract attention from Overstock.com's poor performance and accounting irregularities. You can read about that episode in investigative reporter Gary Weiss's blog post entitled, "Anatomy of an Overstock.com Smear" and in noted forensic accountant Tracy Coenen's blog post entitled, "Overstock "executive" playing on the internet again." I believe that I present a problem for Patrick Byrne and Overstock.com because I began asking difficult questions right about the time that Byrne was touting his phony "turnaround". I say "phony" and "turnaround" (in quotes) because the turnaround never materialized, contrary to Byrne's assertions. It is highly irregular for a participant in a conference call to be singled out and limited to three questions posed in advance, each consisting of 25 words or less. I believe that such a condition would be at variance with the principles of free and full disclosure required by the securities laws at conference calls. You appear to be imposing conditions on me that are not imposed on other conference call participants. I will not accept special conditions that are not imposed on other participants in the conference call. Byrne's terms were a problem for several reasons. For one, the terms would have limited the time I had to analyze Overstock's fourth quarter results. It would also limit my ability to ask follow up questions. I also would not have the benefit of hearing management's dialogue and analysts' questions during the call to help me refine my questions-as other participants do during these calls. I called into the earnings conference call anyway, hoping that Patrick Byrne would reconsider the special terms imposed on me. However, I was completely blocked from asking questions. As detailed below, I can see why Patrick Byrne and his cronies have gone to extraordinary lengths to threaten me, harass me, defame me, and smear me. They don't like the questions I have asked in this blog and they simply didn't want me asking these questions in a live conference call. Overstock.com would rather answer softball questions heralded by gutless analysts craving for access to the unprincipled management team running Overstock.com. ...well, I know I said several times a year, a year and a half ago, that the turnaround prediction, the turnaround was going to look like this. We were going to start at the, as close to the bottom of the income statement as we could, and that meant getting the contribution dollars, the contribution profit turnaround, that's gross profit minus marketing. You'd see that returning a growth or hyper-growth, then you'd see growth in gross profit dollars, and only last would you see a revenue growth accelerate. ... go to slide five and gross profits grew in 2007 at a healthy 36% clip, and slide seven shows that contribution profits actually tripled to 100% growth. That's exactly as we predicted it would come. We actually feel - I feel great about that. But, as I have shown all year in my blog, the turnaround has been nothing but a hoax fed by a combination of drawing on excessive reserves setup in the previous fiscal year and overstating EBITDA in violation of Regulation G. Even the cash flow that Byrne now hypes is really a result of accounting slight of hand. It took some time, but the market seems to have finally seen through Byrne's con. Unfortunately, the investors that believed Byrne lost as much as 75% of their investment in 2007. Now, there are signs that the may also be SEC closing in on Byrne. With a little luck, the investors who were taken advantage of may soon see the truth about Overstock.com's accounting games. Well, gross bookings (a non GAAP measure) did increase to $342.6 million in the fourth quarter compared to $319.6 million in the previous year's quarter, or about a 7% increase while GAAP revenues increased only 2% as noted above. So I suspect that the accounting error accounts for some of the difference. But, other problems also must have played a role. Patrick, why did you use a non-GAAP revenue measure to report sales expectations for the fourth quarter, knowing that GAAP sales were lagging so far behind the non-GAAP measure? The Overstock management team most certainly did not want me to be able to ask questions like that. What better way to avoid it than to require that I submit my questions ahead of time, in writing, and limiting me to just three inquiries? Did Patrick Byrne use non-GAAP "gross bookings" to hype fourth quarter sales on TV? If we take Patrick Byrne at his word, then the last three weeks of the quarter must have been dismal. If the CEO is to be believed, sales must have declined in the last three weeks of the quarter to the extent that most of the revenues gains in the first ten weeks of the quarter were wiped out. But, using a non-GAAP financial measure such as gross bookings allowed the CEO to avoid disclosing the abysmal truth. While the rest of the online retail industry was enjoying double digit sales gains, Overstock.com's sales barely budged. This is nothing new for the double-talking CEO who has routinely used non-GAAP financial measurements as they suit him, depending on his agenda at the time. In a previous blog item, I detailed how Byrne interchangeably used both GAAP and non-GAAP sales figures prior to Overstock.com's IPO in 2002. The trouble was, during that period he used these two sales measures interchangeably without ever telling the user which measure he was using, leading one to conclude that Overstock's sales were much higher than they really were at the time. It now appears that the SEC may be zeroing in on Overstock.com's accounting and disclosure issues. A comment in the company's fourth quarter earnings release confirms that the SEC has already had some impact on company accounting. The SEC started a formal investigation of the company on May 9, 2006. For over a year Byrne downplayed the investigation, falsely asserting that the SEC was actually after his imagined enemies, the "blackguards." 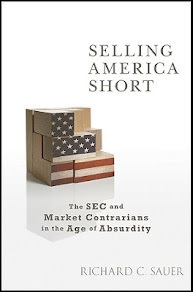 However, on August 12, 2007, Byrne's version of reality appeared to turn even darker when he let it slip that he is actually the real target of the SEC's nearly two year long probe. What is interesting about this error is how elementary it was. Any sophomore accounting student knows that you record sales when title transfers. In the case of Overstock, that is at product delivery. This makes me wonder just how competent is Overstock.com's CFO David K. Chidester? For that matter, how competent is the recently departed (for a second time) Jason C. Lindsey, the company's CFO until mid-2003. As CPAs both Chidester and Lindsey should have known that you wait until title passes to book revenues. Worse yet, is that PricewaterhouseCoopers, Overstock.com's auditors, failed to notice the revenue recognition irregularities for nearly 10 years. How can that be? Well, unfortunately it is just more of the same for Overstock.com. As detailed in prior blogs, and again below, Overstock.com simply cannot get its act together on even the simplest of financial reporting issues. During the fourth quarter conference call, Byrne downplayed the importance of the revenue accounting error. 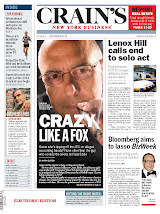 He also used another common tactic of deceptive CEOs, blame shifting. In the past, Byrne blamed the company's poor results on Sith Lords, cows crossing the road (that purported prevented delivery of goods), dead bodies and cocaine in trunks, and dozens if not hundreds of other unlikely causes. This time, it was Amazon's fault. According to Byrne, everyone else including Amazon was doing it, so Overstock did too. Let me explain real quickly, just when do you recognize a sale? Do you recognize it -- the convention has been and many -- has been when you ship the product, in the case of when you ship things by UPS and FedEx, title does not actually change until the consumer receives it. At the beginning of our Company's history, we looked at it, and the difference was immaterial or small enough, and of course, we don't really know exactly when people receive their products in general or we did not eight years ago. Plus, as far as we could tell in the industry, everybody recorded at ship date. Amazon, according to their financial statements, recorded at ship date. As a former fraudster, I've used that sort of tactic before too. So I knew to look at Amazon's 2006 10-K and see if Byrne's claim was true. I was not surprised to learn that, again, Byrne was deceiving investors. According to Amazon's 2006 10-K, filed almost a year ago, it recognizes revenue upon delivery, just like it is supposed to. So, contrary to what Patrick Byrne asserted in the fourth quarter call, Amazon records revenue upon delivery. We evaluate the criteria outlined in Emerging Issues Task Force (EITF) Issue No. 99-19, Reporting Revenue Gross as a Principal Versus Net as an Agent, in determining whether it is appropriate to record the gross amount of product sales and related costs or the net amount earned as commissions. Generally, when we are primarily obligated in a transaction, are subject to inventory risk, have latitude in establishing prices and selecting suppliers, or have several but not all of these indicators, revenue is recorded gross. If we are not primarily obligated and amounts earned are determined using a fixed percentage, a fixed-payment schedule, or a combination of the two, we generally record the net amounts as commissions earned. Commissions and per-unit fees received from third-party sellers and similar amounts earned through Amazon Enterprise Solutions are recognized when the item is sold by the third-party seller and our collectibility is reasonably assured. We record an allowance for estimated refunds on such commissions using historical experience. Byrne has always said that his company's mid-2003 revenue accounting change made it comparable to Amazon. But, after reading Amazon's revenue accounting policy, the two don't look comparable to me. Amazon's disclosure makes it sound like it records most of these "third party" sales (the same as "fulfillment partner" sales in Overstock's model) as "commissions" and "per unit fees." Through Amazon Services, we offer Amazon Marketplace and Merchants@ programs that enable third parties to sell their products on our websites, allow customers to shop for products owned by third parties using our features and technologies, and allow individuals to complete transactions that include multiple sellers in a single checkout process. We are not the seller of record in these third-party seller transactions, but instead earn fixed fees, sales commissions, per-unit activity fees, or some combination thereof. Sales of products by third-party sellers on our websites represented 28%, 28%, and 26% of unit sales in 2006, 2005, and 2004. Since revenues from these sales are recorded as a net amount, they generally result in lower revenues but higher gross margin per unit. Since we focus on profit dollars rather than margins, we are largely neutral on whether an item is sold by us or by a third party. So, unlike Overstock, Amazon reports these third party sales at the net amount of commissions earned. At about 28% of revenues last year ($10.7 billion) this equals approximately $3.0 billion in commissions recorded as revenues. Taking this a little farther, if Amazon's margins on third party goods are 15% (about what most companies receive on these sales) then gross sales on third party goods would have been about $20.0 billion. That means if Amazon had used the same "gross" method that Overstock uses, its sales would have been $17.0 billion higher than reported. Yes, $17.0 billion higher, or $27.7 billion in total revenues. So why does Overstock use this method that makes its sales seem higher, while Amazon uses a method that makes its sales seem much lower by comparison? This could make for a good follow up blog. Was this the final adjustment? Management also claimed during the fourth quarter call that, if its auditors and the SEC do not agree with the change, then they might have to allocate the change to other accounting periods. Does this also mean they might have to restate revenues? Maybe it is nothing. But, management rarely leaves the door open for more changes without reason. And then there's the problem of former Director John A. Fisher's recent declaration in a court filing in response to Copper River's countersuit. In a previous blog item I noted how Overstock.com's directors appeared to be distancing themselves from Patrick Byrne. Now I am wondering about Fisher's conflicting statements regarding Overstock.com's mid-2003 revenue accounting change. In the declaration he claims the accounting change made Overstock.com comparable to Amazon. But as I discussed earlier, that is not true. Did Fisher really understand what he was signing off on when the audit committee approved that change? Patrick Byrne once said, "...I think 'EBITDA' is the stupidest thing I ever heard emanate from Wall Street (no small feat)...." (From a 2006 letter attacking Business Week journalist and critic Tim Mullaney). But in the second quarter of 2007, Patrick Byrne had a sudden change of heart. He now claims that he has always believed in using EBITDA, but only in one extremely rare case. That case is a business turnaround but only when the company can reduce capital spending in the future. In my days as a CFO, I can't recall ever seeing that scenario. But, surprisingly, Byrne claims that's exactly the situation Overstock is in now. But, for some reason, Byrne can't even stick to the definition of EBITDA when hyping his supposed "turnaround." I'm sure it has nothing to do with the fact that the company has never managed to post an annual GAAP profit in its entire history. It couldn't have anything to do with the fact that, with sales declining in the final weeks of the fourth quarter and for the entire year, the company had virtually no chance of reporting a GAAP profit, or even positive EBITDA, in the year of its much hyped "turnaround" (2007). For the first time in our history, we were EBITDA positive for two consecutive quarters (Q3 and Q4 2007), generating positive $6.3 million of EBITDA during those six months. Oh really? Below, I analyze how Byrne played games with the numbers by violating SEC Regulation G to materially overstate EBITDA in the combined third and fourth quarters by about $2 million or 46.5%. In addition, the reversal of excessive reserves booked by Overstock.com in the previous fiscal year inflated its reported EBITDA ever further. As was the case with the simple issue of revenue cut-off, since Overstock.com began to tout its EBITDA performance in 2007, management can't get that measure right either. As I detailed in earlier blogs, it seems that Byrne and Overstock.com have managed to violate SEC Regulation G in every quarter since. Not content by the earnings inflation already provided by EBITDA, it seems Byrne needs just a bit more juice. That juice comes from an unusual calculation of EBITDA which has further misled investors. Some of those investors, by the way, have lost over 75% of their investment in less than three months as a result of what we now know to have been a con-the phony "turnaround". In two previous blog posts entitled, "Overstock.com and CEO Patrick Byrne: Securities and Exchange Commission Regulation G Violations," and "Overstock.com and CEO Patrick Byrne: Improper use of EBITDA results in Regulation G Violation," I detailed how Overstock.com appears to have violated Securities and Exchange Commission Regulation G in its second and third quarter 2007 10-Qs. Now it appears that Overstock.com is attempting to play a game of catch up by correcting previous errors in non-GAAP financial reporting in its recent earnings release for the fourth quarter of 2007. Despite the efforts to clean up its disclosures, Overstock.com's EBITDA measure still seems to violate the SEC definition of EBITDA under Regulation G.
Let's review certain selected Overstock.com EBITDA disclosures during fiscal year 2007: This next table shows year-to-date operating loss and non-GAAP measures at the end of the second, third, and fourth quarters. What's interesting about the year to date disclosures is that the story changes every quarter. In the second quarter 10-Q, Overstock.com included the full amount of restructuring costs ($12.283 million) as part of EBITDA. They then computed a non-GAAP financial measure called "Adjusted EBITDA" to eliminate the effects of its restructuring charges. That got them to a positive number (Adjusted EBITDA). But as demonstrated in a previous blog post, Overstock.com violated Regulation G which precludes removing charges that have occurred in the prior two years (or are expected to occur in the following two years) in non-GAAP performance measures such as adjusted EBITDA. In addition, as demonstrated in other previous blog posts, it was the reversal of excessive reserves setup at the end of the previous fiscal year that contributed to the entire amount of amount of Overstock.com’s positive “Adjusted EBITDA” in the second quarter. I will return to this issue later. The fourth quarter year-to-date presentation shows yet a different presentation. This one eliminated the effects of just a fraction of the restructuring charges taken earlier in the year. In the fourth quarter 8-K, Overstock.com eliminated the effects of just $2.169 million of restructuring charges from EBITDA. In effect, this time Overstock.com presented "Adjusted EBITDA" as though it were the real thing, EBITDA. The accounting profession has always valued consistency as one of its highest principles-right next to conservatism. But, if Overstock.com did not eliminate any of the $12.283 million of its restructuring charges from EBITDA calculation in the second and third quarter fiscal year 2007 10-Qs, why did it suddenly exclude $2.169 million of the $12.283 million from EBITDA in the fourth quarter? And, if somehow the new figure is correct, why were the old figures in error? How did that slip through the cracks? I doubt Patrick Byrne would have wanted me to ask this compound question during the conference call either. Unfortunately for me, I would have had to use up all three questions Byrne would allow just to get to the bottom of just this one issue. Which EBITDA calculation is correct? Hint: According to Reg G, none are correct. The "E" in EBITDA means earnings, or net income. Therefore, the intended meaning of "earnings" for EBITDA under Regulation G is "net income as presented in the statement of operations under GAAP." That is, Overstock should have based its computation of EBITDA on net income, adding back only interest, depreciation, and amortization (there were no taxes to add back). In what appears to be direct violation of this requirement, Overstock.com instead based its computation of EBITDA on "operating loss" rather than "net income" as the starting point. As detailed in my previous blog post entitled, "Overstock.com and CEO Patrick Byrne: Improper use of EBITDA results in Regulation G Violation" this had the effect of materially overstating EBITDA for the second and third quarters of 2007, as well as the six months ended June 30, 2007 and the nine months ended September 30, 2007. Now Overstock.com is at it again in the fourth quarter 8-K by not reconciling EBITDA to net income, it also materially overstated its fourth quarter and full year 2007 EBITDA disclosure. The biggest reason the six-month Overstock EBITDA numbers are positive is all the depreciation expense, which reflects old investments the company made before it cut back on investments to conserve cash. But the EBITDA figure would have been $2.9 million lower for the six months if they had counted costs from stock and options as investments. EBITDA - EBITDA (a non-GAAP measure) for the three months ended December 31, 2006 and 2007 was $(27.4) million and $2.2 million, respectively. For the twelve months ended December 31, 2006 and 2007, EBITDA was $(55.7) million and ($4.0) million, respectively. We believe that, because our current capital expenditures are significantly lower than our depreciation levels, discussing EBITDA at this stage of our business is useful to us and investors because it approximates actual cash used or cash generated by the operations of the business. As the charts above illustrates, Overstock.com overstated EBITDA as defined by the SEC under Regulation G for all four periods presented in its 8-K and by material amounts (5% or over). In fact, in three of the periods presented in the latest 8-K, EBITDA was misstated by over 20%. Incredibly, in the most important period presented (full year 2007), the period of Byrne's purported turnaround, EBITDA was overstated by nearly 300% according to Regulation G.
As the charts above illustrates, Overstock.com materially overstated EBITDA as defined by the SEC under Regulation G in each of the last three quarters of fiscal year 2007. The company overstated EBITDA by about $2 million or 46.5% in the last two quarters combined and about $3.683 million in the last three quarters combined (all material amounts). What is the most directly comparable financial measure calculated and presented in accordance with GAAP? Maybe Overstock's argument is that, under the consistency principle, when you begin with an erroneous number in calculating a non-GAAP measure, you should reconcile to the same erroneous number. But, that makes about as much sense as the sophomore accounting teacher changing the exam key to match David Chidester's mid-term answers. No, we should look to the Regulation itself for guidance on the right reconciliation figure, rather than making it up as it suits us. Therefore, a non-GAAP performance measure must be reconciled to items such as "income or loss before taxes or net income or loss" or a measure of liquidity must be reconciled to items such as "cash flow from operations." In short, if EBITDA is presented as a performance measure, it must be reconciled to net income (or loss, in the case of Overstock). Question 12: Are the requirements in Item 10(e) (1) (i) of Regulation S-K for the prominent presentation of, and reconciliation to, the most directly comparable GAAP financial measure or measures intended to change the staff's historical practice of requiring the prominent presentation of amounts for the three major categories of the statement of cash flows when a non-GAAP liquidity measure is presented? This means that the only other alternative available to Overstock was to reconcile EBITDA to one of the three measures of cash flow reported on the cash flow statement. Well, it's pretty clear from Overstock's reconciliation which I presented earlier, the company did not follow Regulation G. Why? Overstock.com did not reconcile EBITDA to net income nor did it reconcile to one of the three major categories of cash flow. But, I find it is still helpful to examine the nature of the error to better understand management's actions. That might help us figure out how the error was made. So which measure should Overstock have reconciled to? Was it a Performance Measure or a Liquidity Measure? Therefore, Overstock.com it should have reconciled EBITDA to one of the three major categories of cash flows. So why didn't Overstock make the required reconciliation? Was it ignorance of the standard? Or was it trying to hide the fact that, in the case of Overstock.com, EBITDA is not a "reasonable measure of actual cash used or generated by the operations of the business"? The key words are “I admit they are very bad, they were bad on purpose…. we used the fourth quarter to get rid of all the slow moving inventory..... We have sold it.” But, the bad inventory wasn’t gone if you are to believe Overstock.com's 10-K disclosures. This is clear because inventory reserves rose from about $4.5 million at the end of the third quarter to about $6.6 million at the end of the fouth quarter. On a relative basis, inventory reserves went up a staggering 299% from about 6.14% of gross inventory at the end of the third quarter to about 24.52% of inventory at the end of the fourth quarter. If Overstock.com had sold its entire fourth quarter inventory at its original cost basis during the following year, the company would have realized gross margins of 24.54%, far higher than it has ever reported in its operating history. How could Overstock.com have “sold it” and gotten “rid of all the slow moving inventory” if the company actually estimated that it had more slow moving inventory in both absolute dollars and relative amounts? Was Overstock.com booking excessive inventory reserves at the end of the fourth quarter of 2006 to help boster future earnings? After all, Lindsey had claimed that Overstock.com made its fourth quarter results "very bad on purpose" and that the company had sold "all of the slow-moving inventory" in the fourth quarter. As discussed above and in previous blog posts, the reversal of excessive inventory reserves set up at the end of the previous fiscal year had a significant material impact on Overstock.com’s reporting of positive EBITDA in the third quarter of 2007. Inventory reserves dropped about $1.6 million during the third quarter to $2.2 million from $3.8 million at the end of the second quarter, and therefore contributed about 73% of the recomputed positive EBITDA as defined under SEC Regulation G. Therefore, after factoring out the reversal of excessive inventory reserves, EBITDA as computed under SEC Regulation G would have been a mere $606 thousand, far less than the $4.085 million EBITDA improperly reported by Overstock.com. Going back to the second quarter of fiscal year 2007, Overstock.com reported “Adjusted EBITDA” (which eliminated the effects of restructuring charges as described above) of $2.034 million. However, inventory reserves dropped about $2.7 million during the second quarter to $3.8 million from $6.5 million at the end of the first quarter. Even without considering that Overstock.com had improperly eliminated restructuring costs from "Adjusted EBITDA" in violation of SEC Regulation G, Overstock.com’s reported positive “Adjusted EBITDA” squarely resulted from the reversal of excessive inventory reserves. If we factor out the reversal of excessive inventory reserves ($2.7 million) from Overstock.com's improperly reported "Adjusted EBITDA" of $2.034 million, Overstock.com's reported "Adjusted EBITDA" would have been negative $666 thousand. To make matters worse, as described in a previous blog post, Overstock.com reversed $1 million of previously recorded restructuring expenses during the second quarter of fiscal year 2007. The reversal of restructuring expense of approximately $1 million resulted in increasing Overstock.com's improperly reported "Adjusted EBITDA" by yet another million dollars. Therefore, if we factor out both the reversal of excessive inventory reserves and restructuring costs, Overstock.com's improperly reported "Adjusted EBITDA" would have been negative $1.666 million. If we compute EBITDA under SEC Regulation G and factor out the combined contributions to EBITDA resulting from the reversal of excessive inventory reserves and restructuring costs, Overstock.com's properly reported EBITDA would have been negative $9.545 million in the second quarter. Free cash flow for the year was positive $7.4 million and operating cash flow was positive $10.1 million. Byrne makes similar comments in the conference call later that day. But what Byrne doesn't tell you, the most important part of the story, is that Overstock's operating cash flow was positive because he took longer to pay his suppliers this year. If you take out the $13.0 million increase in accounts payable, operating cash flow falls to negative $2.9 million. Subtracting out the increase in accounts payable, free cash flow plummets to negative $5.6 million. But that doesn't tell the full story either. Overstock spent just $2.6 million for capital expenditures in 2007. That number is clearly not repeatable for an online retailer like Overstock. 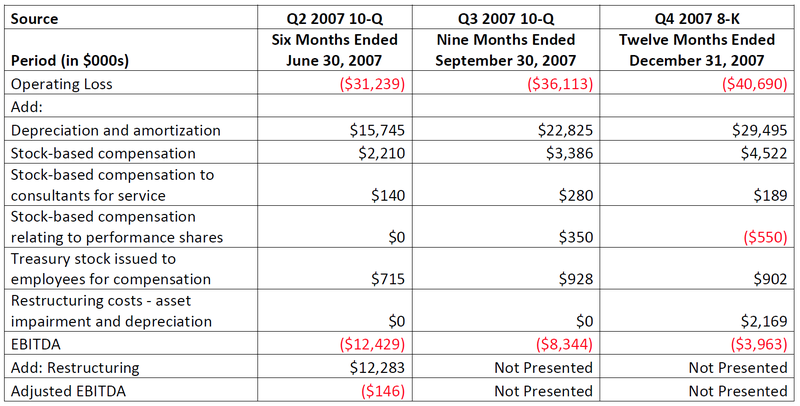 If the company had spent the same amount in 2007 as it spent in 2006, free cash flow would have been at least $25 million in the red. In the future, Overstock.com will need to spend considerably more if they are going to stay competitive. Overstock's competition includes extremely well funded online retailers like eBay, Amazon, and Blue Nile and established brick and mortar stores who also have strong online operations, including Walmart, Target, and Circuit City. Do you think these guys will be cutting back on technology spending in the future? Not a chance.